To go directly to the overview of Harvey’s library, click here [Excel spreadsheet]. “It is not books, that make the skillfullman, but the knowledg of bookes: & the memorie of knowledg: & the practis of memorie, both in words, & in deeds.” Harvey in Guicciardini, Detti et Fatti, sig. BIv. “Tell me what you eat, and I will tell you what you are” goes the well-known aphorism, but how much more appropriate would it be to say “Tell me what you read, and I will tell you what you are”? Scanning someone’s bookshelves constitutes a special kind of intellectual voyeurism. The spines in a library can tell you much about a person, and there is a great tradition of thought that associated libraries with the biographies of esteemed figures of history. That applied in extremis to the pragmatic humanist Gabriel Harvey, whose “working library” was impressive both in size and in quality—something he himself frequently boasted of. This essay explores the nature of the AOR corpus and situates it within the context of Harvey’s larger, known library – those imprints that have not been included in the AOR corpus. Moreover, this essay accompanies Kristof Smeyers’s survey of the books owned by Harvey and their current-day, physical location, the results of which can be found here [Excel spreadsheet]. The earliest, currently known and documented acquisition in Harvey’s library is dated January 1566, when Harvey was 14 or 15 years old and just about to enter Christ’s College, Cambridge. It is Erasmus’ Parabolae sive similia (Basel, 1565), now at the Folger Shakespeare Library in Washington, DC. The last certain addition Harvey made to his library dates from (or after) 1618: John Napier’s A description of the admirable table of logarithmes (Londo, 1618). It is more than likely that Harvey continued to add to his library collection until his death in 1631, but, despite a few vague clues, there is no conclusive evidence as to which books these might have been. In her Gabriel Harvey. A Study of His Life, Marginalia, and Library (1979), Virginia Stern included the tragic testimony of W. Carew Hazlitt, who at the end of his seminal 1899 reconstruction of portions of Harvey’s library in a Quaritch catalogue mentioned a “tract, published in 1626, occurred many years ago at an auction, bearing Harvey’s autograph.” But Hazlitt did not write down the title, nor can the autograph be confirmed as Harvey’s on paleographical grounds. In the five decades that separate the acquisitions of Harvey’s Erasmus and Napier, it is nonetheless clear that he carefully invested in the growth of his “pragmatic library.” As argued in the contextual essay hosted on the AOR site by Matt Symonds and Earle Havens, “The History of the Book,” early modern print culture was also an “information culture.” Expansive libraries of humanists like Harvey provided vital cogs in the wheels of a much larger, ambitious program of information accumulation and preservation, access and utilization, as never before. Harvey’s library did not only function as a reflection of his intellectual and practical interests, but also as a tool for reclassifying knowledge itself, and making “the knowledg of books” readily accessible in ways that might change the world. His copious marginalia–not just annotations, but also his extensive underlining and system of symbolic information classification–are proof of the library’s optimized and operational functionality. Harvey’s library may have been large (conservative estimates speak of 1,200 books, more aspirational approximations reach as high as 4,000), but he was no bibliomaniac searching for the finest and rarest copies of a given text. Foremost his collection served eminently practical, personal purposes. During Harvey’s half-century of active book collecting and annotation, the 158 books listed here were, at one time or another, part of his larger collection. After Harvey’s death in 1631, this legacy was sadly dispersed. 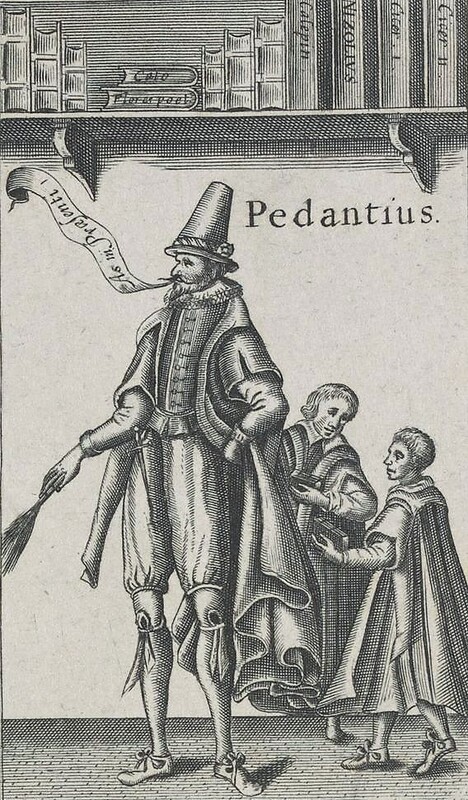 Within a year’s time his illustrated edition of Ovid’s Metamorphoses (Frankfurt, 1563) had already been sold, indicated by a dated inscription on its title page: “Stephanus Jones / Jan. 14 1632 / pr. 3s. 8d.” Harvey’s books seemingly forever in a permanent state of international and trans-oceanic diaspora, ended up scattered in private, public, and academic libraries across the English-speaking world and beyond, where they often arrived, one-by-one, from various sources at various times. This working catalogue of Harvey’s books, linked to their current locations, is the result of a careful, but inevitably incomplete reconstruction. If there ever was a contemporary library inventory kept by Harvey or his heirs, it has not survived. This catalogue builds, rather, upon the essential bibliographical spadework performed by Virginia Stern in her essential 1979 bio-bibliographical analysis of Harvey’s library and reading, which had itself built up upon earlier, older booklists. The earliest major attempt at reconstructing the fragments of Harvey’s library was the already mentioned 1899 Hazlitt effort, whose chapter “Gabriel Harvey” in Bernard Quaritch’s catalogue Contributions toward a Dictionary of Book Collectors, Part XIII (London, 1899) reassembled 25 books and one manuscript. G. C. Moore Smith’s Gabriel Harvey’s Marginalia (Stratford-upon-Avon, 1913) more than doubled that inventory to 53 books and nine manuscripts. More books were attributed to Harvey’s library by Frank Marcham in his 1927 edition of Harvey’s text, Lopez the Jew. Moore-Smith supplemented his own inventory years later in “Printed Books with Gabriel Harvey’s Autograph or MS. Notes,” Modern Language Review 29 (1934): 68-70. Our 21st-century attempt to expand upon their work compiles and cross-references these previous catalogues, adding several more volumes we have tracked to collections such as the National Library of Wales and the Collection of American Cartography. As books are rarely static objects, the whereabouts of items formally identified only through secondary records have been updated with their current known locations, where possible. Some of Harvey’s book have resurfaced since Stern’s extensive inventory of 1979, others appear to have submerged once more under the long shadows of history. Books highlighted in yellow designate those whose location is (possibly) no longer correct, their last known whereabouts dependent upon second-hand records in older published catalogues. Volumes whose correct attribution to Harvey’s library are questionable have not been included. Any additional books that may yet to be identified as Harvey’s are most likely to be excavated through evidence of his tell-tale marginalia, as well as through bibliographical citations preserved in his writings and letters. Happily, it was Harvey’s custom to allude to books frequently and sometimes in great bibliographical detail, such as Machiavelli’s Discorses on Livy or Edmund Spenser’s Shepheardes Calender, which suggests that he will often have had those books within reach at any given time. In other instances he was more forward about precise details of proximity, as when he referred to Pietro Aretino’s Quattro comedie in a note, “Habeo et legi,” scrawled on the first pages of his copy of Euripides’ Hecuba. In the absence of more specific bibliographical detail, however, these have also been excluded from this list. Alternatively, where Harvey’s ownership of a given title is certain, but its location is not, the last known location is provided as a frame of reference. Moore-Smith’s 1934 bibliographical supplement illustrates perhaps the most convincing way to identify a book as Harvey’s, through his consistent habit of recording in dramatically clear handwriting his signature, or his elaborate “GH” monogram (sometimes both) on the title page. More irregularly, he noted down the date of purchase (or date and source of a book gift), and at times even the price paid and practical method of a volume’s acquisition. Pierre du Ploiche’s A treatise in Englishe and Frenche (London, 1578), for example, bears a gift inscription from the author himself: “Ex dono Autoris, Monsieur du Ploiche,” Harvey wrote on the title page. This is quite uncommon, for Harvey is not known to have travelled abroad, and many of his books came from continental presses in Paris, Basel, Rome, Antwerp, and Venice. He is likely to have assembled his vast library within a single location, perhaps less likely his residences in Cambridge and London, than in his family seat in Saffron Walden, his “Tusculan villa” (“Tusculano nostro”) as he affectionately called it. The encompassing nature and diverse subject matter of Harvey’s library is best defined by its wide range of polyglot titles, in ancient and modern languages. These span as the fields of law, history, statesmanship, language, military strategy, rhetoric, medicine, classical drama, topography, and the contemporary pamphlet literature of London. The majority of classics appear in Latin and Greek (sometimes in vernacular translations, e.g. Aristotle, Cicero, Livy)–as well as essential contemporary literary and philosophical works, including Chaucer, More, and Gascoigne. Notably absent are heavily illustrated books, and titles concerned with music and the visual arts. Though a professor of classical rhetoric with 77 volumes in Latin, a surprisingly large minority, some 65 in all, appear in English. The others are in Greek, and more commonly the French and Italian vernaculars. Harvey owned some titles in more than one language, including Castiglione’s Il libro del Cortegiano and Guazzo’s La civil conversatione appear in the original Italian, and in Elizabethan English translations, for example. Of other books he kept several versions in the same language, like Machiavelli’s The art of warre, of which he owned two English-language copies. Harvey often read the books in his library in conjunction with one another: Cicero together with Quintilian for example, or St Augustine’s De civitate Dei together with Vives’ comments on that Church Father. He, like his fellow humanists, read centrifugally; that is to say, his library formed a highly interconnected network of books that spoke to and referenced one another, whether simply by sitting together on the same shelves, or more actively on Harvey’s reading desk evidenced through marginal annotations linking one passage with another across related volumes. The question remains how the books included within the AOR Harvey corpus (highlighted in green in our catalogue) sit in relation to Harvey’s library as a whole; that is, within the provisional reconstruction of his library attempted here. The selection of the AOR corpus depended on several factors, the most practical of these being the somewhat arbitrary disposition of initially eight, and eventually nine, Harvey annotated books in the possession of our AOR partner institution, the Princeton University Library. These books reflect the dynamic and highly contingent nature of book collecting: books were added to the Princeton library collection over a long period of time, were purchased when they become available at auction or through the offices of antiquarian booksellers with direct contacts to Princeton, or to associated and donors to Princeton such as Lucius Wilmerding Jr. Thomas Tusser’s Elizabethan book of husbandry, which had generally remained inaccessible in private collections for almost a century, was purchased at the Pirie auction in 2015), and then promptly added to the AOR corpus in medias res. As a result, the nine Harvey books owned by Princeton do not form a thematic unity, per se. Rather, with books on warfare, (Roman) history, law, political economy (i.e., husbandry), and linguistics, these books are scattered refugees reflective of larger aspects of Harvey’s intellectual interests. This is not to say that the Princeton books do not overlap in any respect. Indeed, in certain cases clear links between the books at Princeton were established by Harvey himself as, for example, Harvey’s interest in gout, which guided his annotations of passages in books one normally would not connect directly to one other Olaus Magnus’s topographical history of Sweden, the Historia de gentibus septentrionalibus, and Philipp Melanchthon’s Selectarum declamationum, a collection of university lectures largely concerned with logic, rhetoric, and theology. In addition to the nine books from Princeton, other titles were added to the Harvey AOR corpus, often based on factors such as availability (does the binding allow for the book to be digitised?) and the affordability of digitization within a given repository. The inclusion of five other titles, in addition to those at Princeton, allowed for the expansion of the topics and the formation of “clusters” of books: books which thematically overlap, and which may have been read in conjunction with one another, as mentioned above. Those additions comprise two books from the Folger Shakespeare Library (bound together in one volume), Domenichi’s Facetie, motti, et burle and Guicciardini’s Detti et fatti piacevoli et gravi, both storehouses of witticisms and jokes which align nicely with two other volumes in the Harvey corpus, Castiglione’s Il Cortegiano from the UCL Library, and its English translation by Thomas Hoby from the Newberry Library’s collection. 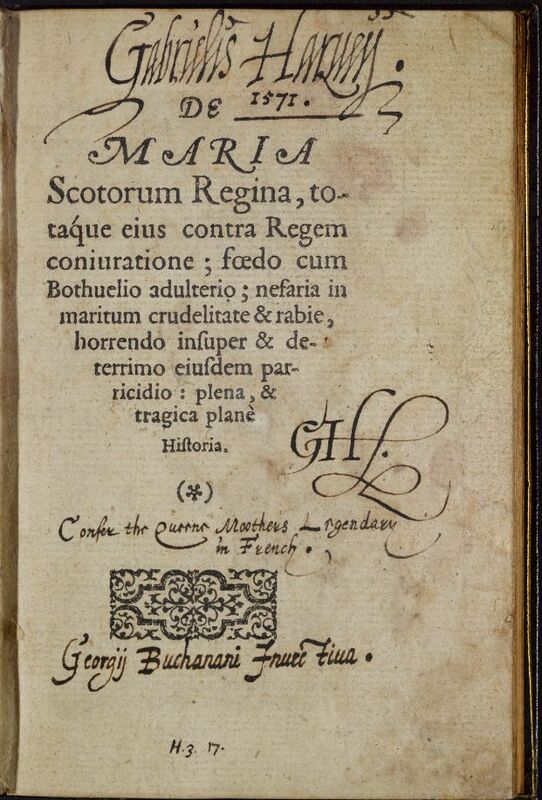 Finally, the inclusion of the English translation of Frontinus’ Stategematafrom the Houghton Library at Harvard deals with topics quite similar to those addressed by Harvey’s annotations in Machiavelli’s Art of War at Princeton. This particular approach to building up the Harvey AOR corpus was rewarded by further marginal links made by Harvey himself, as in his copy of Livy’s history of Rome. There he specifically cited the “stratagema, apud Frontinum, et Polya[e]num frequens” (p. 59), which was echoed elsewhere in the same volume, “Frontinus libro I. cap. 6” (p. 334). In relation to Harvey’s library as a whole, there are unavoidable gaps in the AOR corpus, particular with respect to titles on the natural sciences and the medical arts, as well as imaginative, contemporary literary works, even if these areas comprised only a minority of the known volumes in Harvey’s collection. Harvey did indeed own a copy of Sacrobosco’s Textus de sphaera, a standard astronomical textbook at the time, as well as John Balgrave’s The mathematical iewel and Jacobus de Saa’s De navigatione. The latter is even owned by Princeton University Library, but unfortunately it was too tightly bound to accommodate digitisation. Still, the AOR corpus does accurately encompass subjects of greatest interest to Harvey, particularly in the areas of courtesy and courtly conduct, ancient and modern history, languages and oratory, and warfare. In the AOR corpus, Harvey deployed a wide range of annotation forms, comprising marginal notes, marks, underscores of the printed texts, a system of symbols, and even occasional “visual marginalia” in the form of representational drawings. What is generally lacking in the corpus, by contrast, are examples of Harvey’s own active physical manipulation of books. 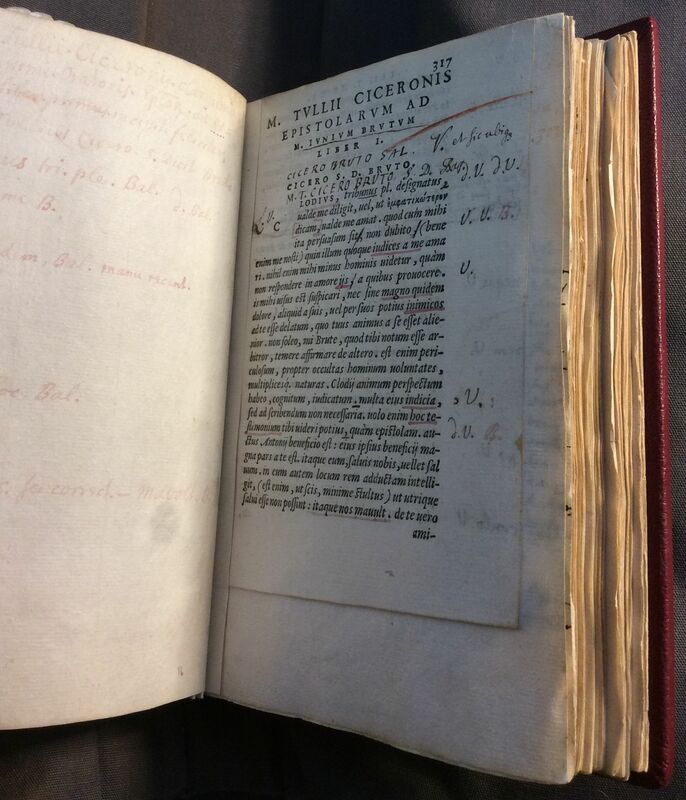 Harvey’s copy of Cicero’s Epistolae ad Atticum (Venice, 1563), for example, at the British Library, is interleaved with blank leaves that have themselves been annotated, creating something of a “metatextual” layer of interpretation and textual customization. While AOR Phase 2 could not materially expand the Harvey corpus, it does extend the sampling of intensive Renaissance annotation methods through books from John Dee’s contemporary library collection. There the AOR team greatly expands the entire project corpus with a preponderance of books that reflect a more intensive exploration not only of early modern natural philosophy, but also a much wider range of physical forms of marginal interventions. Ultimately, digitized, select corpora of early modern annotated books can appear to be misleading, if they are simply presumed to reflect the larger collection whence they came. It is easy, furthermore, to simply pass over lightly annotated books of any length as unimportant (particularly where the books themselves are short, amounting to less than, say, 100 pages), or as too costly to justify the investment in digitization (where they are many hundreds of folio pages in length). Here, the AOR Harvey corpus actually benefitted from starting directly with the collections of one particular institution, the Princeton University Library, which seem to reflect the general tenor of Harvey’s books, including several lightly annotated books (such as the two short Buchanan works, also the much longer and larger tomes of Freigius, Melanchthon, and Magnus Olaus). While Melanchthon’s Selectarum declamationum and Freigius’s Paratitla (a compendium of civil law), for example, would not have been obvious candidates to include in a project like AOR for these reasons, both books turned out to be valuable components of the AOR corpus through what they reveal about certain of Harvey’s specific reading strategies. Only including and focusing concerted effort on the densely annotated “treasures” of an early modern library containing lots of marginalia might not, in the larger analysis, constitute the best strategy. In general though, when it comes to assembling digitized corpora, we deal with the same factors collectors have been facing throughout human history: personal tastes and intellectual interests, fundamental financial considerations, and the general availability and suitability of certain books to broader research applications never before imagined in previous generations.